A rose by any other name may smell as sweet, but one annoying invasive weed may hold the answer to treating the superbug MRSA. Researchers from Emory University have found that the red berries of the Brazilian peppertree contain a compound that turns off a gene vital to the drug-resistance process. Treating bacterial infections by bombarding them with antibiotics in hopes of killing the microbes can lead to mutations in the bacteria. As the bacteria copy themselves at an astronomical rate, some mistakes to their genetic code (mutations) are made along the way. Some of the mutations are beneficial to the bacteria, and can even make them resistant to antibiotics. These bacteria survive better than their non-resistant brethren, and before we know it, we have created dangerous superbugs—bacteria that are resistant to most of the antibiotics in our arsenal—leaving us weaponless against deadly infections. 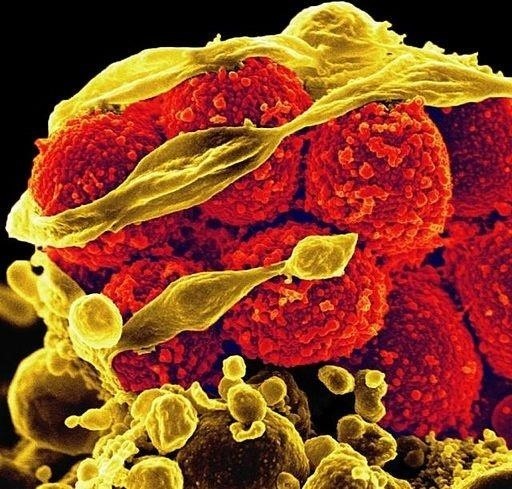 MRSA, also known as methicillin resistant Staphylococcus aureus, is one of those superbugs—a devastatingly significant source of infection and death worldwide. Much more dangerous than everyday staph, MRSA causes a skin infection that kills tissue by excreting toxins. The infection can require limb amputations, move through the blood to other parts of the body, and progress to deadly blood infections. In 2011, it was responsible for 80,461 invasive infections and 11,285 deaths in the US alone. The peppertree discovery, recently published in Scientific Reports by Assitant Professor Cassandra Quave and her team from the Center for the Study of Human Health and the School of Medicine's Department of Dermatology, gets around the issue of creating resistant bacteria. The research team discovered an extract from the peppertree berries that turned off an important gene the Staph bacteria use to communicate with each other. Without communication, the bacteria can't call other bacteria to the scene of an infection. This process—called quorum sensing, much like having enough people to convene a meeting—is vital for the bacteria's potency and pathogenicity. Quorum sensing is needed for the bacteria to perform functions like excreting its toxins. "It essentially disarms the MRSA bacteria, preventing it from excreting the toxins it uses as weapons to damage tissues," Quave said in a press release from Emory University. "The body's normal immune system then stands a better chance of healing a wound." Peppertrees are native to South and Central America, but have moved into semitropical and tropical regions of Africa and the US, including Florida, Alabama, Texas, and California. Religious artifacts found among the ancient Chilean Amerindians relics reveal that they have been used for centuries for their medicinal powers. Every part of the tree has been used for different medicinal purposes—the bark as a stimulant, tonic, and astringent, and externally for rheumatism, gout, and syphilis; the sap as a laxative and diuretic; the resin as a wound healer; the leaves prepared as a tea or decoction for colds, hypertension, depression, menstrual disorders, respiratory and urinary infections, and irregular heartbeats. It came as no surprise to Quave that a weed might hold special survival powers. According to her, those invasive weeds that spread far and wide and prove nearly impossible to get rid of tend to have an advantage—often a chemical inside them—that provides them with protection from forces in the environment that would kill them. These chemicals allow them to survive and spread. Over 50 compounds and chemicals have been identified in the essential oils of the peppertree plant and the red berries contain 5% essential oils. Two of those chemicals are triterpenes and sesquiterpenes, compounds also found in turpentine and vitamin A. These biologically active chemicals are known to have a strong odor that may deter herbivores from eating the plants, while also attracting predators and parasites of the herbivores. The oils also are natural agricultural pesticides. Quave and her team purified different compounds from the berries of the peppertree and tested them against bacteria in the lab, and against MRSA infections in mice and cultures of human skin cells. The compound, which they named 430D-F5, stopped the formation of a quorum of bacteria, thereby inhibiting the release of cell-destroying toxins from the bacteria. When researchers injected the skin of mice with MRSA and the compound, those mice got significantly less tissue damage than the mice injected with MRSA alone. In addition, the extract did not harm the skin of mice, human skin cells in culture, or hurt normal, healthy skin bacteria that provide a layer of defense against other pathogenic organisms. The researchers extracted one component from the berries that worked against MRSA, but the plants themselves are part of the poison ivy, poison oak, poison sumac, and poisonwood family and the berries should not be eaten for any reason. Likewise, the sap, resin, and oils that are present in all parts of the plant can cause skin irritations. It's best to avoid this plant altogether if you spot it growing. The researchers are hopeful that further testing on the peppertree berry compound will prove that it can help fight MRSA infections. Pre-clinical trials—experiments in lab animals—will be next, and if all goes according to plan, those will be followed by human clinical trials. This despised weed may have found its niche after all.